A Los Angeleno, by way of India and the Tri-State area, Monika’s childhood upbringing in dual countries brings a unique perspective to her views on the modern female experience. 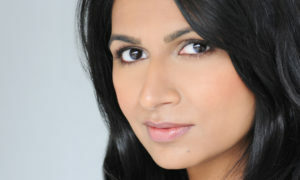 From her own struggles with the cultural expectations laid upon her by a traditional, male-dominated Indian family to experiences of emotional and physical abuse as a young woman, she’s learned firsthand how societal norms, family and even women themselves—often unknowingly—play a role in reinforcing what she calls the Invisible Fence, the psychological barrier that keeps women from taking risks preventing them from reaching their full professional, emotional and spiritual potential. It’s the goal of breaking this barrier that’s been a driving force in Monika’s pursuits over the past 10 years. In a move frowned upon by her family, she left behind a lucrative—yet unfulfilling—scientific position at Johnson & Johnson, and chose to venture outside the comfort and success she had always found in science and academia. She allowed her natural entrepreneurial spirit to take hold and embraced the unknown with the launch of Mini Yums, a popular dessert food truck in Los Angeles. In 2013, she and her husband Puneet let their wanderlust be their guide in an effort to learn more about their beautiful new home state of California. Traveling up the Pacific Coast Highway, one question repeatedly began to cross her mind: Wouldn’t it make sense to see everything a place has to offer with help from someone who lives there? This simple thought starter has led to Monika’s latest exciting endeavor, GLYD, a platform that connects travelers with locals in their desired destination to request and book custom-curated digital and personal experience itineraries. Through partnerships with consulates in Malaysia, India and the U.S. Department of State, as well as her own business connections in the travel, entertainment and tech industries, she hopes the success of GLYD will not only spark employment opportunities for women in countries across the globe, but also make immersive, life-changing travel experiences more accessible, affordable—and less daunting—for female travelers. Most importantly, she hopes her story helps other women break away from simply living the life that’s expected of them, so that future generations of women and young girls will never experience the emotional and psychological confines of the Invisible Fence. “You have the stuffed raven until Tuesday.” The post Check out taxidermied animals at this library in Alaska appeared first on Matador Network. You won’t find this at H&M. The post Greenland’s national costume is a work of art appeared first on Matador Network.